Successfully Added Innokin Kroma Box Mod Kit - 510 Thread, 2000mAh, 6 To 75W, TC, VV/VW, 2ML SlipStream Tank, Sub-Ohm (Black) to your Shopping Cart. 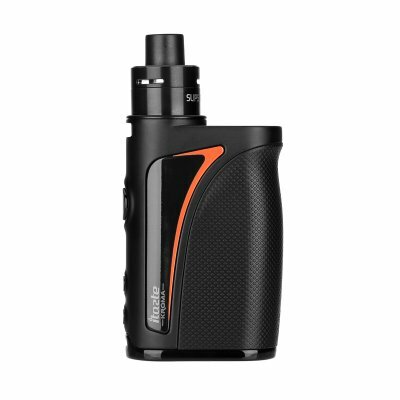 Meet the Innokin Kroma, a high-end 75W box mod kit that is the perfect e-cig for advanced vapers and beginners alike. Whether you’re looking for a way to upgrade your current vape experience, or are new to the vaping world but wish to enter it in order to get rid of your tobacco smoking habit – this 75 Watt electronic cigarette is sure to meet your demands. With its sophisticated 2000mAh built-in battery, this e-cigarette brings along plenty of juice – allowing you to vape the day away and enjoy a relaxing vaping session whenever you feel like it. With its stylish and compact design, it is extremely portable and can be conveniently carried along wherever you go – letting you enjoy numerous tasteful vapes throughout the day. Coming with a 510 thread, this box mod kit is compatible with almost any RTA out there – allowing you to upgrade your vape experience and customize it in order to meet your own personal vaping demands. With its 2ml tank, this box mod kit is capable of holding plenty of your favorite tasting e-liquid. All you have to do is attach your tank to your box mod by simply screwing them together, fill up your RTA, and you’ll be all set to sit back, relax, and enjoy a great vape. With its adjustable temperature control, this box mod kit lets you set your temperature range between 150 and 315 degrees Celsius. Additionally, it also features manual airflow control and the capability to hold different coils that, depending on its material, can resist 0.1 to 1-Ohm. From now on you’ll be able to fully personalize the amount of taste and vapor produced with each puff you take – not only letting you enjoy your vaping sessions to the most but also letting you create exceptionally large vapor clouds that are sure to impress people standing by. Intergraded within its durable Zinc alloy and stainless steel body, lays a beautiful OLED display that constantly keeps you updated on the current settings enabled on your e-cig. By providing you actual information on the selected temperature, Ohm resistance, Wattage, and more – you can be assured that you’ll always have the right settings enabled to enjoy your vapes in the way you personally love most. Perfect for any type of vapers out there – the Innokin Kroma is a 75W electronic cigarette that is sure to enhance your vaping experience and brings along countless hours of relaxing and tasteful vaping sessions to come.